Both the Likud party, the Labour party and the Moledet 'homeland', a tiny right wing party flags all show their logo [instead of the Magen David] on the national flag which is a common practice in Israel since many municipalities follow this pattern too. In the Flags of Aspirant Peoples chart appears "27. Judea (State of, 1989) (West Bank, Judea & Samaria) - Israel." 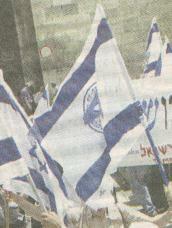 Similar to national flag, but Magen David replaced by six blue triangles forming a kind of dislocated Magen David, shifted to hoist. The upper right triangle includes a white menorah, the lower left triangle includes something not identified (it reminds me some ritual object, but I am not able to say more - a talith maybe?). There is something written in Hebrew between hoist and lower part of emblem. Is/was such a flag used by Israeli settlers in the West Bank, who could have proclaimed an "independent" state to show their anger against the Israeli government (or to refuse Israeli administration)? I have tried to reproduce the Hebrew script, probably with mistakes. Well, it took me some time to figure it out, but what is supposed to be written there is Gur arie Yehuda (Juda [is a] Lion cub). [This flag is] not in use. It was in use just for a very short period by a very small group of right-wing settlers as a protest against the government. I do not think that they took it too seriously (at least no other one did) and it did not impress the government so this episode was soon to be over. I would not call them aspirant people. The symbol on the bottom left is a head of a lion, as in the inscription, which is blue as well. I happen to own this flag. The State is a project, of sorts, of followers of the late Rabbi(s) Kahane, whose usual symbol, a fist over a Star of David (which appeared on flags in Israel as black on yellow, or, occasionally, yellow on black) is illegal in Israel. However, while the idea of the State, never officially declared as far as I know, is still mentioned (ironically by some left-wingers as well), the flag seems to have fallen into disuse. [This is] not correct. Neither the symbol nor the movement are illegal. The movement was banned from taking part in the elections after the Supreme Court decision that it is a racist movement whose aims are in contradiction with the democratic nature of Israel. Also, I have not heard about the State for years.